Biomass can be converted directly into liquid biofuels for use in our vehicles. 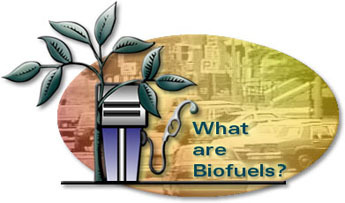 The two most common types of biofuels are ethanol and biodiesel. Ethanol (an alcohol) is currently made primarily from the starch in corn grain. It's most commonly used as an additive for petroleum-based fuels to reduce toxic air emissions and increase octane. Today, around one-third of the gasoline sold in the United States includes 5%10% ethanol. Ethanol is also available as an alternative fuel. E-85 is an alternative fuel blend containing 83% ethanol in the summer and 70% ethanol in the winter. Flexible fuel vehicles (FFVs) have corrosion-resistant fuel systems and other modest modifications to accommodate either E-85 or regular gasoline. The largest U.S. automobile manufacturers each offer several models as flexible fuel vehicles at little or no additional cost. Currently, there are more than 200 E-85 fueling stations in 30 states for flexible fuel vehicles. For a more detailed description of Ethanol, check out this article in our resource guide entitled What is Ethanol . Biodiesel is made primarily from soybean oil. Its use is currently relatively small, but its benefits to air quality are quite dramatic. A recently enacted subsidy should greatly stimulate use. Biodiesel is typically blended at 20% with petroleum diesel. This fuel blend is called B-20. B-20 is used chiefly by vehicle fleets, which get credit for using alternative fuel vehicles without having to purchase new vehicles. B-20 is also available to individual consumers with diesel vehicles. There are nearly 180 B-20 fueling stations in about two-thirds of the states.